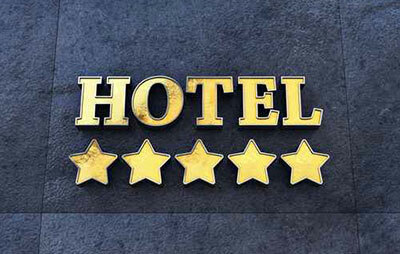 The close collaboration AIM has with international hotel chains and the world’s leading establishments effectively prepares students for the labor market thanks to operational or management internships. We regularly receive representatives of the palaces: Dorchester Group (Plaza Athénée, Meurice), Four Seasons (Georges V, Grand Hotel Cap-Ferrat), Peninsula, Royal-Monceau, Bristol... and major hotel chains: Intercontinental, Hilton, Hyatt, Marriott, Accorhotels... with days dedicated to the presentation and thereafter, interviews with students, whether for their management training or internships for their future jobs. Students and Ms. Bergund Salen, the director of internships, choose the country and the hotel with the approval of the Studies direction. They each receive on average 3 to 5 firm placements. During periods of internship, they are found in all the palaces and great hotels of the world, starting with those of Paris. 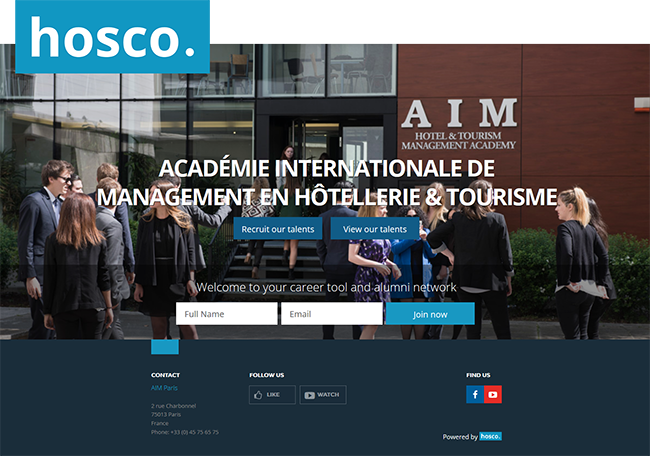 AIM is one of the first Hosco's partners, a recruitment and linking platform for hotels and tourism companies. Why not apply a daily alternation? I strongly advise against these type of schedule! During the summer period from May to September, students who have completed their 1st year of studies embark on a four to five-month summer internship in France or abroad. 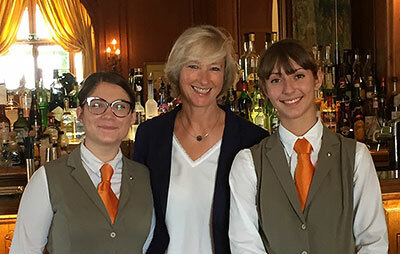 Modeled on the internships undertaken by students enrolled at France’s most prestigious «Grandes écoles» , these industry work placements – as they are known – usually involve working in the Front Office or in the Housekeeping and Food & Beverage (restaurant/ bar) departments where customer service is a top priority. Oct. Nov. Dec. Jan. Feb. Mar. Apr. May Jun. Jul. Aug. Sept. The subsequent internship upon completion of the 2nd year of the program involves a management training work placement lasting for 6 months in France and up to 8 months abroad enabling students to apply and broaden their knowledge of the management practices and systems that exist in major hotels in the accommodation, catering, headquarters, management, finance, accounting, purchasing, marketing and human resources departments. Oct. Nov. Dec. Jan. Feb. Mar. Apr. May Jun. Jul. Aug. Sept. Oct. Nov. Dec.
For students that do not wish to continue their studies, AIM facilitates commencing work immediately upon completion of the 3-year course and replacing the period of their last internship (possible until the end of December) with paid employment, often used as a probationary period when embarking on an career abroad. *Management Training: non-compulsory, but recommended if the student wishes to continue to the 2nd year of the MBA Pro.